Michiel Adriaenszoon de Ruyter is one of the most famous admirals in Dutch history. De Ruyter is most famous for his role in the Anglo-Dutch Wars of the 17th century. He fought the English and French in these wars and scored several major victories, the best known probably being the Raid on the Medway. The pious De Ruyter was very much loved by his sailors and soldiers; from them his most significant nickname derived: Bestevaêr (older Dutch for 'grandfather'). He is honoured by a statue in his birthplace Vlissingen, where he stands looking over the sea. De Ruyter was born in 1607 in Flushing (Vlissingen) as the son of beer porter Adriaen Michielszoon and Aagje Jansdochter. Little is known about De Ruyter's early life, but he probably became a sailor at the age of 11. In 1622 he fought as a musketeer in the Dutch army under Maurice of Nassau against the Spaniards during the relief of Bergen-op-Zoom. That same year he rejoined the Dutch merchant fleet and steadily worked his way up. According to English sources he was active in Dublin between 1623 and 1631 as an agent for the Vlissingen-based merchant house of the Lampsins brothers. Although Dutch sources have no data about his whereabouts in those years, it is known that De Ruyter spoke Irish fluently. He would occasionally travel as supercargo to the Mediterranean or the Barbary Coast. In those years he usually referred to himself as "Machgyel Adriensoon", his name in the Zealandic dialect he spoke, not having yet adopted the name "De Ruyter". "De Ruyter" most probably was a nickname given to him. An explanation might be found in the meaning of the older Dutch verb ruyten or ruiten which means "to raid", something De Ruyter was known for to do as a privateer with the Lampsins ship Den Graeuwen Heynst. In 1631 he married a farmer's daughter named Maayke Velders. The marriage lasted until the end of the year 1631 when Maayke died after giving birth to a daughter who followed her mother in death three weeks later. In 1633 De Ruyter set sail for Jan Mayen Island serving as first mate on a fleet of five whalers. He repeated this action in 1634 and 1635. At this point he did not yet have a command of his own. In the summer of 1636 he remarried, this time to a daughter of a wealthy burgher named Neeltje Engels, who would give him four children. One of these died shortly after birth, the others were named Adriaen (1637), Neeltje (1639) and Aelken (1642). In the midst of this, in 1637, De Ruyter became captain of a private ship meant to hunt for raiders operating from Dunkirk who were preying on Dutch merchant shipping. He fulfilled this task until 1640. After sailing for a while as schipper (skipper) of a merchant vessel named de Vlissinge, he was contacted again by the Zeeland Admiralty to become captain of the Haze, a merchant ship turned man-of-war carrying 26 guns in a fleet under admiral Gijsels fighting the Spanish, teaming up with the Portuguese during their rebellion. A Dutch fleet, with De Ruyter as third in command, beat back a Spanish-Dunkirker fleet in an action of Cape St Vincent 4 November 1641. After returning he bought his own ship, the Salamander, and between 1642 and 1652, he mainly traded and travelled to Morocco and the West Indies to amass wealth as a merchant. During this time his esteem grew among other Dutch captains as he would regularly free Christian slaves by redeeming them at his own expense. In 1650 De Ruyter's wife, who in 1649 had given him a second son named Engel, unexpectedly died. On 8 January 1652 he married the widow Anna van Gelder and decided the time had come to retire. He bought a house in Flushing, but his blissful family life would not last long. During the First Anglo-Dutch War (1652–1654), De Ruyter was asked to join the expanding fleet as a subcommander of a Zealandic squadron of "director's ships": privately financed warships. After initially refusing and stating he wasn't qualified enough for such a job, De Ruyter proved his worth under supreme commander Lieutenant-Admiral (the nominal rank of Admiral-General was reserved for the stadtholder but at the time none was appointed) Maarten Tromp, winning the Battle of Plymouth against Vice-Admiral George Ayscue. He also fought at the Battle of Kentish Knock, the Battle of Plymouth and the Battle of the Gabbard. 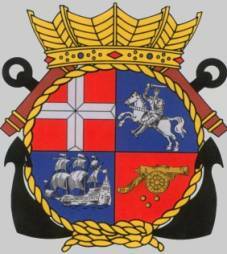 De Ruyter functioned as a squadron commander, being referred to as a Commodore, which at the time was not an official rank in the Dutch navy. 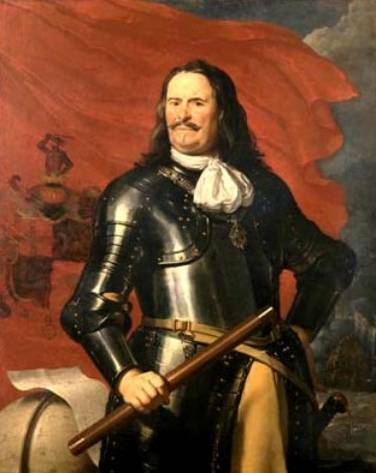 Tromp's death during the Battle of Scheveningen ended the war and De Ruyter declined an emphatic offer from Johan de Witt for supreme command, because he considered himself 'unfit' and also feared that bypassing the seniority principle would bring him into conflict with Witte de With and Johan Evertsen. Later De Ruyter and De Witt would become personal friends. Colonel Jacob van Wassenaer Obdam then became the new Dutch supreme commander of the confederate fleet. De Ruyter - after refusing to become Obdam's naval 'advisor' - remained in service of the Dutch navy however and later accepted an offer from the admiralty of Amsterdam to become their Vice-Admiral on 2 March 1654. He relocated with his family to the city in 1655. In July 1655 De Ruyter took command of a squadron of eight of which the Tijdverdrijf was his flagship and set out for the Mediterranean with 55 merchantmen in convoy. His orders were to protect Dutch trade. Meeting an English fleet under Robert Blake along the way, he managed to avoid creating a new flag incident. Operating off the Barbary Coast he captured several infamous corsairs and having negotiated a peace agreement with Salé, De Ruyter returned home May 1656. The same month the States-General, becoming ever more wary of Swedish king Charles X and his expansion plans, decided to intervene in the Northern Wars by sending a fleet to the Baltic Sea. The Swedes controlled this area after Charles had invaded Poland and made himself king there. De Ruyter once again embarked on the Tijdverdrijf arriving in the Sound the 8th of June; there he waited for Lieutenant-Admiral Jacob van Wassenaer Obdam to arrive. After Obdam had assumed command De Ruyter and the Dutch fleet sailed to relieve the besieged city of Gdańsk on 27 July, without any bloodshed. Peace was signed a month later. Before leaving the Baltic De Ruyter and other flagofficers were granted audience by Frederick III of Denmark. De Ruyter took a liking to the Danish king who would later become a personal friend. In 1658 the States-General decided to once again send a fleet to the Baltic Sea to protect the important Baltic trade and to aid the Danes against Swedish aggression, continued despite a peace settlement. In accordance with the States' balance of power politics a fleet under Lieutenant-Admiral Jacob van Wassenaer Obdam was sent, without De Ruyter, who at the time was blockading Lisbon. On 8 November a bloody melee took place: the Battle of the Sound, which resulted in a Dutch victory, relieving Copenhagen. Still the Swedes were far from defeated and the States decided to continue their support. 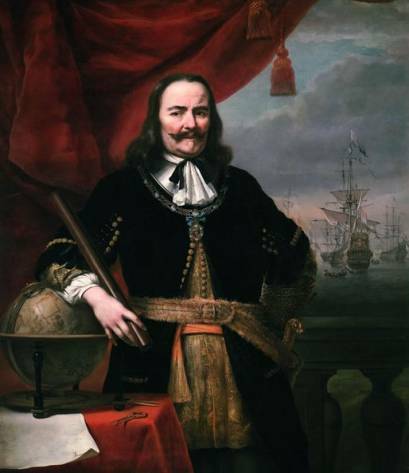 De Ruyter took command of a new expeditionary fleet and managed to liberate Nyborg in 1659. For this he was knighted by the Danish king Frederick III of Denmark. From 1661 until 1663 De Ruyter had convoy duty in the Mediterranean. In 1664, a year before the Second Anglo-Dutch War officially began, he clashed with the English off the West African coast, where both the English and Dutch had significant slave stations, retaking the Dutch possessions occupied by Robert Holmes and then crossing the Atlantic to raid the English colonies in America. Arriving off Barbados in the Caribbean at the end of April, 1665 aboard his flagship Spiegel, he led his fleet of thirteen vessels into Carlisle Bay, exchanging fire with the English batteries and destroying many of the vessels anchored there. Unable to silence the English guns and having sustained considerable damage to his own vessels, he retired to French Martinique for repairs. Sailing north from Martinique, de Ruyter captured several English vessels and delivered supplies to the Dutch colony at Sint Eustatius. Given the damage he had sustained, he decided against an assault on New York (the former New Amsterdam) to retake New Netherland. He then took off to Newfoundland, capturing several English fishing boats and temporarily taking St. John's before proceeding to Europe. On his return to The Netherlands he learned that Van Wassenaer had been killed in the disastrous Battle of Lowestoft. Many expected that Tromp's son Cornelis would now take command of the confederate fleet, especially Cornelis Tromp himself, who had already been given a temporary commission. Tromp however was not acceptable to the regent regime of Johan de Witt because of his support of the Prince of Orange's cause. De Ruyter's popularity had grown after his heroic return and, most importantly, his affiliation lay with the Estates-General and Johan de Witt in particular. 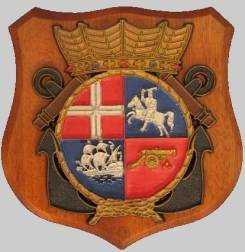 He therefore was made commander of the Dutch fleet on 11 August 1665, as Lieutenant-Admiral (a rank he at the time shared with six others) of the Amsterdam admiralty. In this Second Anglo-Dutch War (1665–1667) he won a hard-fought victory in the Four Days Battle (June 1666) but narrowly escaped disaster in the St James's Day Battle (August 1666) which brought him into conflict with Cornelis Tromp, eventually leading to Tromp's dismissal. He then became seriously ill, recovering just in time to take nominal command of the fleet executing the Raid on the Medway in 1667. The Medway raid was a costly and embarrassing defeat for the English, resulting in the loss of the English flagship HMS Royal Charles and bringing the Dutch close to London and the war to its end. Between 1667 and 1671 he was forbidden by De Witt to sail, in order not to endanger his life. In 1669 a failed attempt on his life was made by a Tromp supporter, trying to stab him with a bread knife in the entrance-hall of his house. De Ruyter saved the situation for the Netherlands in the Third Anglo-Dutch War. His strategic victories over larger Anglo-French fleets at the Battles of Solebay (1672), the double Schooneveld (1673) and Texel (1673) warded off invasion. The new rank of Lieutenant-Admiral-General was created especially for him in February 1673, when the new stadtholder William III of Orange became Admiral-General. Again taking the battle to the Caribbean, this time against the French, De Ruyter arrived off Martinique aboard his flagship De Zeven Provinciën on 19 July 1674. He led a substantial force of eighteen warships, nine storeships, and fifteen troop transports bearing 3,400 soldiers. Attempting to assault Fort Royal, his fleet was becalmed, allowing the greatly outnumbered French defenders time to solidify their defenses. The next day, newly-placed booms prevented de Ruyter from entering the harbor. Nonetheless, the Dutch soldiers went ashore without the support of the fleet's guns, and were badly mauled in their attempt to reach the French fortifications atop the steep cliffs. Within two hours, the soldiers were returning to the fleet, with 143 killed and 318 wounded, as compared to only fifteen French defenders lost. His ambitions thwarted and with the element of surprise lost, De Ruyter sailed north to Dominica and Nevis, then returned to Europe while disease spread aboard his ships. In 1676 he took command of a combined Dutch-Spanish fleet to help the Spanish suppress the Messina Revolt and fought a French fleet under Duquesne twice at the Battle of Stromboli and the Battle of Agosta, where he was fatally wounded when a cannonball hit his left leg. On 18 March 1677 De Ruyter was given an elaborate state funeral when his body was buried in the Nieuwe Kerk (New Church) in Amsterdam. He was succeeded as supreme commander by Cornelis Tromp in 1679. De Ruyter was highly respected by his sailors and soldiers, who used the term of endearment Bestevaêr ("Granddad") for him, both because of his disregard for hierarchy (he was himself of humble origin) and his refusal to back away from risky and bold undertakings despite his usually cautious nature. Respect also extended far beyond the borders of the Republic. On his last journey home, the late Lieutenant-Admiral-General was saluted by canon shots fired on the coasts of France by the direct orders of the French king Louis XIV. The town of Debrecen erected a statue of him for his role in freeing 26 protestant Hungarian ministers from Slavery. In the 2004 election of De Grootste Nederlander (The Greatest Dutchman) Michiel de Ruyter was the seventh most voted. 'Michiel de Ruyter' is the default name for the Dutch in Sid Meier's 1994 game, Colonization. He was buried in the Nieuwe Kerk (New Church) in Amsterdam. De Ruyter's burial site has now turned in to a tourist attraction. De Ruyter's praalgraf is visible, protected by a glass pane. However, descendents of the De Ruyter family are granted unrestricted access to his grave, and De Ruyter's descendent stated in a 2007 issue of Dutch newspaper Het Parool that he visited the coffin privately in 1948 with his own grandfather, and they decided to lift the coffin's lid. The grand-grand son was shocked with the sight and said: "it wasn't a pleasant sight. He (De Ruyter) was embalmed with great haste, and they didn't bother with his shot-off leg, they just dropped it in. It was just lying there. No, it wasn't pleasant, it was a shock actually ". De Ruyter, launched in 1880, was an Atjeh-class unprotected cruiser. De Ruyter, launched in 1926, was an Admiralen-class destroyer. She was renamed Van Ghent to make way for the 1935 De Ruyter. She served in World War II and was wrecked on Bamidjo reef on 15 February 1942. De Ruyter, launched in 1935, was the lead ship of her class of light cruisers. She served in World War II and was sunk in the battle of the Java Sea on February 28, 1942.
renamed after the sinking of the 1935 De Ruyter). 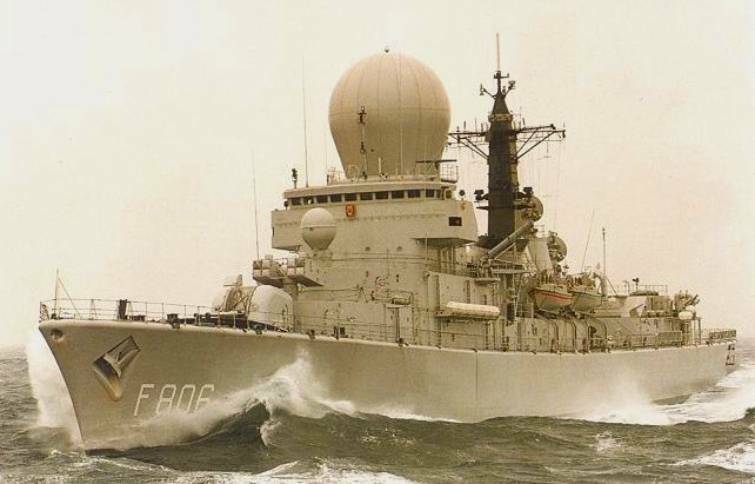 She was sold to Peru in 1973 and renamed Almirante Grau. 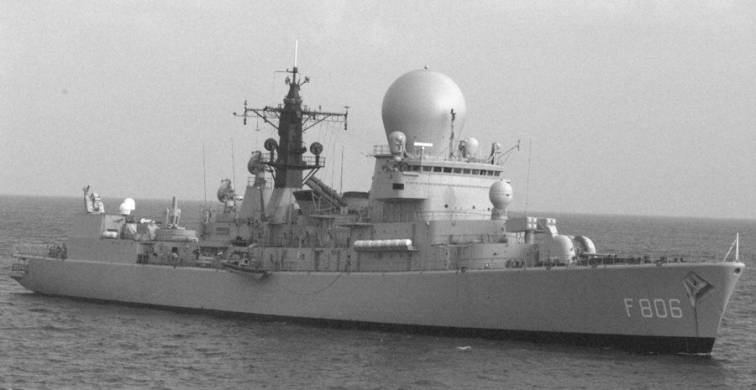 HNLMS De Ruyter (F 806), launched in 1974, was a Tromp-class guided missile frigate. 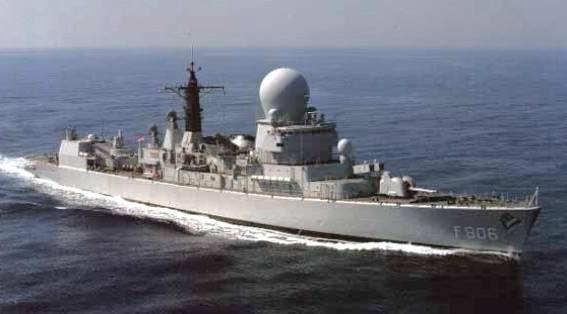 HNLMS De Ruyter (F 804), launched in 2002, is a De Zeven Provinciën-class frigate.